How Best to Access the ISS-and LEO? By Frank Sietzen on May 31, 2009 8:56 PM. Frank's note: Readers, Keith has asked me to keep posting for awhile, so heres my latest query: been reading some of the ideas for a commercially-derived lifting body crewed spacecraft that would make use of the existing expendable launch vehicle fleet, although the spacecraft itself would largely be reusable. My question: If a COTS-D solicitation is to be made, should it be opened to a lifting body as well as a blunt-bodied capsule? Would a spacecraft capable of a Shuttle-like reentry and runway landing be a more efficient way of bringing astronauts-and commercial experiment samples-back from the ISS rather than landing in the ocean and waiting weeks for the capsule and its contents to come back to land? Or would a steerable parachute for the capsule achieve the same capability? What do you think-gliding to a runway vs. splashing in the ocean? By Keith Cowing on May 31, 2009 5:40 PM. "Paul Haney, who was known as the "voice of NASA's Mission Control" for his live televised reports during the early years of the space program, has died of cancer. He was 80. Haney died Thursday at a nursing home. Kent House, owner of the Alamogordo Funeral Home, confirmed that Haney died of complications from melanoma cancer, which spread to his brain and was untreatable. 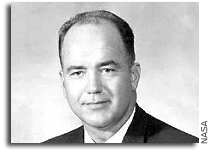 Haney became NASA's information officer in 1958, three months after the space agency was formed and went on to manage information from the Gemini and Apollo flight programs. He pioneered a real-time system of reporting events as they happened in the first manned flight program, Project Mercury." By Keith Cowing on May 30, 2009 6:07 PM. "Add another name to the Augustine commission: ex-NASA astronaut Leroy Chiao. Sources said the former space station crew member likely would be named to the blue ribbon panel headed by retired Lockheed Martin CEO Norm Augustine that will help chart the future of NASA's human spaceflight program. Reached by phone, Chiao said that he had been contacted by administration officials assembling the committee and that they expressed interested. "I don't think I've done anything since I left NASA to [disqualify] me," he joked." Frank's note: Chiao is a superb public speaker who knows how to communicate the excitement and enthusiasm he has for space exploration. It is good that we know at least one person is on that panel that can explain all of this to indifferent Americans. Keith's note: Having worked on several projects with Leroy, I can heartily affirm Frank's assessment. By Frank Sietzen on May 30, 2009 11:01 AM. By Keith Cowing on May 29, 2009 4:16 PM. "President Barack Obama has chosen two long-time advocates of human space flight to lead NASA. On 23 May, the White House nominated former astronaut Charles Bolden Jr. and Washington lobbyist Lori Garver to take the positions of administrator and deputy administrator, respectively, for the space agency. If confirmed by the Senate, Bolden and Garver will confront a series of momentous decisions on where to take NASA in the coming decade." Keith's note: Science Magazine did not do their homework. Lori Garver is not a lobbyist. In fact, she only registered as a lobbyist for one year in 1988 for NSS/SpaceCause - 21 years ago. "A pilot and former Marine, Bolden encouraged the young doctors and scientists to follow the principles he learned in the Corps. "It's our core values -- honor, courage, commitment," he said. "... Be courageous in everything you do. Don't be afraid to stand up to someone who is about to do something wrong, because you know it's wrong. And be committed no matter where you happen to go." By Marc Boucher on May 29, 2009 3:06 PM. "The same Florida weather than forced the space shuttle Atlantis to land in California after its successful mission to the Hubble Space Telescope may also delay launch of the next shuttle mission to the International Space Station." "The shuttle Endeavour is set to lift off June 13 on STS-127 with the final piece of Japan's Kibo laboratory module, but stormy weather at Kennedy Space Center (KSC) threatens a delay in moving Endeavour from Launch Pad 39B - where it stood ready as a rescue craft during the Hubble mission - to Launch Pad 39A that would delay launch on a day-for-day basis." Editor's note: The launch could slip as far as mid-July. By Marc Boucher on May 29, 2009 2:18 PM. "NASA's Centennial Challenges Program and the Spaceward Foundation will hold the 2009 Power-Beaming Challenge, part of Spaceward's Space Elevator Games, at NASA's Dryden Flight Research Center on Edwards Air Force Base, Calif., on July 14." "This is the fourth year for the Space Elevator Games. The first competition required teams to ascend a 50-meter tether at an average speed of 1 meter per second with power provided by ordinary spotlights. This year, to be eligible for the $2 million prize, competitors will be required to race their laser-powered vehicles up a 1-kilometer vertical steel cable at an average speed of 5 meters per second." Editor's note: My sources tell me that there could be winner of this years Power-Beaming Challenge and its $2 million prize. There are 6 entrants in the challenge. The Spaceward Foundation who manage the challenge have also launched a new web site at http://www.spaceelevatorgames.org/. SpaceRef will have full coverage at our Space Elevator Reference web site. NASA, Microsoft Collaboration - Open or Closed Source? By Marc Boucher on May 29, 2009 1:21 PM. "That technological balancing act is among the details revealed in a federal Space Act Agreement establishing the terms of a collaboration announced by NASA and Microsoft earlier this year. The text of the agreement wasn't disclosed at the time, but NASA has now released the documents in response to a request made by TechFlash under the federal Freedom of Information Act." "The text will get a close look, at least, from people worried about governments tethering themselves too tightly to Microsoft's technologies. The agreement is non-exclusive, leaving the door open for NASA to make similar conversions to formats used by alternative space-viewing programs. But data formats have historically been a source of conflict between Microsoft and open-source advocates concerned about government agencies leaning too heavily on proprietary approaches, making them de facto standards." Editor's note: Unfortunately Microsoft is not known as being a friendly open source kinda of company. There's some strange things going here. Not on NASA's part, but Microsoft. The annex of the agreement says NASA will release the software tools developed under the agreement. The article says however that Microsoft described the software as proprietary. That text has now disappeared from the Microsoft page in question. As well the WorldWide Telescope Academic Development Kit in question, which is supposed to be available according to Microsoft, appears to have disappeared as well. By Keith Cowing on May 29, 2009 1:58 AM. "How can we inspire today's science teachers and students to meet the challenge of the American science education crisis and reclaim the worldwide lead in science and technology? Northrop Grumman is flying teachers on the Zero G aircraft to experience weightlessness just like the astronauts -- for a start. This is the story of the adventure from teachers across the nation. A film for teachers, about teacher, but inspiring to us all!" Keith's note: The next step (are you listening NASA?) is to leap ahead of just flying teachers - and to fly students - and not for just 20 seconds - but for much, much longer. Frank's note: Imagine how it would ignite the passion for science if NASA announced, after Orion is fully operational, a seat first for a student experiment inside the Crew Module, then flying a student to the ISS to operate it him or herself! Yes, I know space is limited and there are risks. But...just imagine the possibilities! And I'll go even further (and risk being branded nuts)-pledging to bring a student and the student's experiment to the moon. And I have just the organization to work with NASA on all of this: The ShareSpace Foundation. Why can't students go into orbit just like tourists? It's time, don't you think, to start working in this direction? Continue reading Today's Video: Inspire Me! Weightless Flights of Discovery. By Keith Cowing on May 29, 2009 1:06 AM. "Since 1982, Wood Acres students have learned about astronomy by studying the night sky in the planetarium and through lessons in its classroom. The beige dome is suspended by chains from the ceiling over a carpeted circular pit in the retrofitted classroom. Through a program run by trained parent volunteers at Wood Acres, students in first through fifth grades visit the planetarium six times a year for 45-minute lessons. The program for kindergartners is more condensed; students attend one lesson each week for six weeks, said parent Eloise Keary, who is in charge of scheduling and training for the PTA's planetarium committee. During a class Friday, Jorgensen and John Adams, a parent and NASA aerospace engineer, taught the first-graders about the solar system before gathering the youngsters under the dome. Projecting colorful images of planets on a large screen, Adams talked about their characteristics." By Keith Cowing on May 29, 2009 12:02 AM. "Monkeys Able and Baker, known as "the monkeynauts," were lofted from Cape Canaveral, Fla., 50 years ago today and were the first American mammals to survive a fiery ride into space. On May 28, 1959, Able, a 7-pound rhesus monkey, and Baker, an 11-ounce squirrel monkey, were crammed into the nose cone of an Army Jupiter missile and shot 360 miles into space during a 16-minute mission." By Marc Boucher on May 28, 2009 5:49 PM. "NASA has signed a $306 million modification to the current International Space Station contract with the Russian Federal Space Agency for crew transportation and related services in 2012 and 2013. The firm-fixed price modification covers comprehensive Soyuz support, including all necessary training and preparation for launch, crew rescue, and landing of a long-duration mission for six individual station crew members." By Keith Cowing on May 28, 2009 4:14 PM. "I hope the space station becomes extraordinarily, scientifically productive, but it is not today," said David Leckrone, the senior scientist for the Hubble Space Telescope, one of the agency's most successful and well-regarded programs. Uhran said it is too early in the station program to gauge its success on scientific output, which so far has been meager. The agency's Web site lists 172 station-related research papers -- many of which were not published in peer-reviewed journals. References to Hubble-related published science results, in contrast, number more than 3,500. "Judging the station at this time on its scientific output is a red herring," said John Logdon, a space policy analyst with George Washington University. "It's just getting started." Keith's note: Hmmm, I wonder how much of Hubble's planned research (all of those published papers) got done before its manufacturing flaw (one that no one at STScI caught) was fixed - and after it was fixed (by humans) and was fully operational. ISS is just starting to flex its solar-powered wings. Stay tuned. By Marc Boucher on May 28, 2009 4:02 PM. "In the interests of hastening the process -- some folks are saying that the announcement could come as early as this afternoon -- here's the names of eight members we've been able to nail down:.."
Editor's note: The list includes: Christopher Chyba, Sally Ride, Lester Lyles, Edward Crawley, Bohdan "Bo" Bejmuk, Jeff Greason, Wanda Austin. If the list is accurate there is at least one former astronaut among the panel in Sally Ride and surprisingly Jeff Greason of XCOR. By Marc Boucher on May 28, 2009 3:02 PM. "In the desert of southern California, Virgin Galactic's key supplier Scaled Composites and its subcontractor SNC (Sierra Nevada Corporation) have successfully completed the first tests of the innovative rocket motor that will propel space tourists, scientists and payloads into space. The hybrid Nitrous Oxide system being used is the largest of its kind in the world and it will send Virgin's customers up into sub-orbital space at speeds over 2500 mph (4000kmh), to heights over 65 miles (110km) above the Earths surface, before the spaceship descends back down through the atmosphere using its pioneering feathered re-entry system. " Editor's note: The news was released at the National Space Society annual International Space Development Conference (ISDC). Along with the rocket test video and intro by Sir Richard Branson we've also included a new video from Virgin Galactic called "Let the Journey Begin". Enjoy! By Marc Boucher on May 28, 2009 1:55 PM. "The new analysis of MODIS data has allowed the research team to detect new regions of the ocean affected by iron deposition and depletion. The Indian Ocean was a particular surprise, as large portions of the ocean were seen to "light up" seasonally with changes in monsoon winds. In the summer, fall, and winter -- particularly summer -- significant southwesterly winds stir up ocean currents and bring more nutrients up from the depths for the phytoplankton. At the same time, the amount of iron-rich dust delivered by winds is reduced." Editor's note: Earth observation by satellites provide critical data on the health of our planet. This new report about ocean health plant indicates surprising changes are happening and it's too early to raise the alarm but there is evidence for some concern. Unfortunately it's taken a while to interpret the data and because of this it has not been a priority for the next launch of ocean satellites and the U.S. is losing the capability to get more data. One proposal for a mission which would have the right instrumentation is a NASA decadal survey mission ACE - Aerosol Cloud Ecosystems. However it is not funded. Researchers will continue to get data from the existing satellites but those satellites are nearing the end of their projected life cycle. In the gap the U.S. may have to rely on international partners for data. At least another 10 years worth of data is needed. By Marc Boucher on May 28, 2009 9:02 AM. "Unfortunately, General Bolden lacks deep expertise in space science and engineering and his past ties with the aerospace industry will raise conflict of interest problems. Before the Senate confirms him, it should probe how well fitted he is to guide the agency through a difficult transition from the space shuttle to follow-on vehicles designed to reach the Moon and beyond." Keith's note: When it comes to NASA, there's just no satisfying the NY Times, it would seem. Let's peer into their (anonymous) shallow, drive-by analysis. Tick tick tick - Oops, I find a flaw: Sean O'Keefe - with admittedly zero technical expertise - guided the VSE from nothing to Presidential and Congressional endorsement. Yet uber techie Mike Griffin was handed the VSE on a silver platter, took the Shuttle/Orion gap, made it longer, and then fumbled by designing a rocket that is still not fully out of PDR after 3 years and in danger of cancellation. If Griffin made a "second guess" it certainly was not the right one. Marc Boucher Editor's note: It's so easy to criticize a nominee. In reading the op-ed I get the sense that he's both qualified and not-qualified, which is it? Here's what I know, NASA needs leadership. Is Charles Bolden a leader? Someone people can talk to, who will listen to what his experts tell him and be able to make an informed decision on critical issues? I believe he is. NASA had an technical expert in Mike Griffin, and look at the agency now. Sure Griffin understood the technical details - but was he a leader? Not the kind that NASA needed. Finding the right mix of skill sets and leadership is hard to do for an agency like NASA. Right now NASA needs a leader more than an engineer at the top. NASA has plenty of qualified engineers to provide expert advice to Bolden. Let's get on with the confirmation hearing as quickly as possible and let Bolden get on with the job. History teaches us that leaders, even if they lack some skills can get the job done. Lest we forget who guided NASA during the Apollo years. It was James Webb, a former Marine pilot with a law degree and Washington insider. He wasn't an engineer and yet he managed in his seven year tenure to lead NASA at its most critical time. Frank's note: The New York Times has had an anti-NASA bias for nearly half a century. This is the same newspaper that continually criticized the Apollo program but when the Saturn V assembly lines were closed in September 1969 decried the move as "abandoning" the capability for manned lunar missions. First they criticized the VSE as a questionable series of goals, then claimed it would never win Congressional support, then has continually raised the issue of funding-funding for manned spaceflight that it has always opposed. Truth of fact: who cares what they think anyway? By Marc Boucher on May 27, 2009 5:19 PM. "Membership in the White House/NASA panel being set up to give the Obama administration a quick review of the U.S. human spaceflight program will be announced as early as May 27, and the group of 10 aerospace experts should clear all the regulatory wickets to begin work in about two weeks, according to Norman Augustine, the retired Lockheed Martin CEO who will chair the group." By Marc Boucher on May 27, 2009 4:20 PM. "The 2009 Lunar Lander Challenge is now scheduled and teams that wish to compete may soon register (see contact information (below). The NASA Centennial Challenges is a program of prize contests to stimulate innovation and competition in technologies of interest and value to NASA and the nation. The Lunar Lander Challenge is a prize competition designed to accelerate technology developments in reusable rocket-powered vehicles including vehicles capable of ferrying cargo or humans between lunar orbit and the lunar surface as well as future Earth launch vehicles or other rocket-powered vehicles. The Lunar Lander Challenge is administered for NASA by the X Prize Foundation. The prize purse is funded by NASA." "DATES: The 2009 Lunar Lander Challenge will be held as an open period of competition for flight attempts between July 1, 2009, and October 31, 2009." Editor's note: Official notice posted for this years challenge. Note the new date format. By Marc Boucher on May 27, 2009 2:58 PM. And although the scientist is Russian the source of the story is the Macedonian International News Agency. I'll leave it up to you to draw your own conclusions. "Did a UFO deliberately crash into a meteor to save Earth 100 years ago? That's what one Russian scientist is claiming. Dr. Yuri Labvin, president of the Tunguska Spatial Phenomenon Foundation, insists that an alien spacecraft sacrificed itself to prevent a gigantic meteor from slamming into the planet above Siberia on June 30, 1908." By Marc Boucher on May 27, 2009 12:47 PM. Editor's note: What do you think of the new name, Curiosity, for the Mars Science Laboratory rover? Vote in our poll and comment. "NASA's Mars Science Laboratory rover, scheduled for launch in 2011, has a new name, thanks to a sixth-grade student from Kansas. Twelve-year-old Clara Ma from the Sunflower Elementary school in Lenexa submitted the winning entry, "Curiosity." As her prize, Ma wins a trip to NASA's Jet Propulsion Laboratory in Pasadena, Calif., where she will be invited to sign her name directly onto the rover as it is being assembled." By Marc Boucher on May 27, 2009 12:30 PM. "The International Space Station crew is awaiting the arrival of three new members that will usher in an era of six-person crews aboard the orbiting laboratory. Russian cosmonaut Roman Romanenko, European Space Agency astronaut Frank De Winne and Canadian Space Agency astronaut Bob Thirsk launched aboard a Soyuz spacecraft Wednesday morning from the Baikonur Cosmodrome in Kazakhstan." - After the break you can watch the launch of Soyuz-TMA 15. Continue reading ISS About to Have a Crew of Six With Soyuz-TMA 15 Launch. By Keith Cowing on May 26, 2009 10:24 PM. "Just six days ago I'd wearily downclimbed to Everest's base camp. As I sat in a small blue tent that evening tenuously perched over one particularly malodorous barrel, a loud rockslide thundered directly towards me. I briefly thought of the irony of it all: I had finally summited "The Mountain of My Dreams", only to succumb to a tragic potty accident. Think of all the eulogy possibilities! The intense days of my Everest summit climb, the long descent and my return to Kathmandu's "civilization" have zoomed by, but the key details remain as vivid as the photographs and video we took on top. Simply stated, Everest was the hardest thing I've ever done in my life, physically and mentally, but strangely enough this was also my ultimate reward. Some things just don't have to make sense." By Keith Cowing on May 26, 2009 4:33 PM. "I have always had a soft spot in my heart for Hubble Repair Missions. After all, I cut my teeth on the space beat covering the legendary STS-61 mission in December 1993 the first, the most dramatic - and certainly the most important - of the five astronaut telescope calls now inscribed in the space history books. So I must confess I am a bit wistful even a little misty - now that it is all over." By Marc Boucher on May 26, 2009 4:06 PM. "A critical series of ground tests are scheduled to begin this week at NASA's Kennedy Space Center to confirm that Ares I-X, the precursor to NASA's next generation launch vehicle, will behave as predicted as it lifts off the pad and powers through the initial stage of flight in a demonstration flight later this year." "Computer analytical models developed by the agency have predicted how the Ares I-X will behave when launched. The upcoming ground tests will validate those vehicle models that were used to derive the flight control parameters by comparing test data with the predicted vehicle flight behavior." Why Some Say the Moon? By Frank Sietzen on May 26, 2009 4:03 PM. Frank's note: Readers, in this my last exercise in gauging your ideas before Keith slips back in the saddle, I thought Id ask your views about the moon-specifically on whether or not to make it the initial focus of the VSE. Again, Buzz Aldrin has provoked my thoughts by suggesting that the U.S. defer any manned landings on the moon at all, instead developing a multi-national lunar development regime and using the heavy lift boosters and landers that would be developed by others, not the U.S. In his approach, the focus should be squarely on Mars, via its moons at first. How would each of you use the moon in the context of solar system exploration? Would the U.S. taxpayer stand for seeing the Chinese land on the moon while the U.S. was in a multi-decade Mars mission development program? If the U.S. used the moon to mature technologies for deeper missions to asteroids, or Mars, could a sortie-type approach suffice, or would a permanent lunar base be the better way? Or could we reasonably avoid the moon entirely in a credible manned Mars effort, assuming the Obama administration made such a goal a priority? By Marc Boucher on May 26, 2009 3:25 PM. 1. Mars Reconnaissance Orbiter Science Results and Update - Dr. Richard Zurek will present new science results from NASA's Mars Reconnaissance Orbiter on Wednesday, May 27 at NASA headquarters auditorium between 1-2:30 p.m. The event will also be carried on NASA TV. The briefing will include new images in 3-D.
2. NASA Briefing Provides New Global View of Ocean Health - NASA will hold a media teleconference on Thursday, May 28, at 1 p.m. EDT, to present the first-ever global views of the health of marine plant life. There doesn't appear to be any live NASA TV coverage but there will be live streaming audio. By Marc Boucher on May 26, 2009 1:30 PM. Editor's note: So much for the "hoopla" surrounding the nominations of Charles Bolden and Lori Garver. While I understand President Obama wanted to make the announcement after the Shuttle landed but that the weather scrapped that idea, the way it actually came out was the typical bury it on a long weekend when an administration really doesn't consider it a high priority. This morning in my RSS feed I received from the White House Briefing Room the press release at 3:23 a.m. EDT which had a published stamp on it of 5:31 a.m. Saturday, May 23. And of course as everyone knows the release was released as a statement, the online copy didn't show until today. As well the title of the press release was "President Obama Announces More Key Administration Posts". No mention of NASA or Bolden. If you compare that to other releases from the White House it does provide an indication as to how important the release was. In fact I continue to question how committed the White House is towards NASA. By Marc Boucher on May 26, 2009 1:10 PM. "At issue are the International Traffic in Arms Regulations (ITAR), which are supposed to prevent technological secrets ending up in the hands of 21 proscribed nations, including China, Iran and North Korea. If a technology appears on a document called the US Munitions List, companies need a licence to export it or to reveal details to a foreign national. Even if granted, the licence often forces the firm to mount a security guard on the system while it is in another country." Editor's note: I received a note from Mike Gold who wanted to clarify one item in the above story by the New Scientist. "Specifically, the story says that we paid $220,000 for two guards to watch our coffee table / Genesis Tech Stand. In actual fact, we paid $220,000 to the government for their own monitoring activities, and we also of course had to pay money on top of that for our own security personnel who had to watch all of our ITAR-related hardware and data (not just the coffee table)." Continue reading ITAR Reform Legislation in the Works. By Marc Boucher on May 25, 2009 9:20 PM. Below and continued on the next page you'll find some relevant references to the 1990 report. 19 Years after the report was released Augustine is now chairing the Human Space Flight Panel. A lot has changed in the last 19 years. What lessons have we learned that relate to the 1990 report and the current blue ribbon panel? Continue reading The 1990 Augustine Commission Revisited. By Keith Cowing on May 25, 2009 9:19 PM. Keith's note: Scott and I are headed home (ahead: 24 hrs in transit). After a hectic day yesterday flying from Lukla (imagine taking of from a steeply pitched aircraft carrier stuck in the mountains) to Kathmandu we cleaned up, argued with Qatar Airways, made the traditional pilgrimage to the Rum Doodle Bar, and then rode home in a rickshaw. I want to thank Marc Boucher and Frank Sietzen for keeping the home fire burning here at NASA Watch - and Miles O'Brien for all of his help supporting Scott and I while we were at Everest. By Marc Boucher on May 25, 2009 11:25 AM. Keith's note: I think it is a perfect mix. Let's hope the confirmation goes fast so they can get to work. Editor's note: Here's some more reaction on Charles Bolden and Lori Garver's nominations. "Money and vision will be the toughest challenges the duo of Charles Bolden and Lori Garver face if confirmed to take the helm of NASA, said Dr. Mike Griffin who left the top space agency job in January." "By announcing nominations for both Administrator and Deputy Administrator, the White House has demonstrated that it appreciates the importance of both of these key positions to the future of America's space agency," said Space Foundation Chief Executive Officer Elliot Pulham. "Charlie Bolden is an American hero who brings deep NASA knowledge and experience, and unsurpassed leadership skills to the key position of NASA Administrator. Lori Garver is an experienced space policy professional with significant previous NASA experience, strong knowledge of the space industry, and the political and communication skills that are crucial to communicating with the administration, Congress and the public." "IFPTE once again would like to take this opportunity to thank President Obama for delivering on his campaign promise by providing a $2 billion dollar infusion of additional funds into NASA, despite the current fiscal pressures. We now look forward to working with General Bolden, a man of extreme courage, integrity, and accomplishment, as he works to implement President Obama's vision of a renewed and rebalanced NASA. We are equally pleased with the selection of Lori Garver, who IFPTE believes is not only an outstanding choice for the Deputy's position, but also a person who we expect will play a key role in the future direction of NASA." "America's space program is at a critical crossroad. NASA needs a clearly defined plan and unwavering support from the president and Congress to achieve our nation's space exploration objectives. We look forward to working with the new NASA administrator and his leadership team as we address the rapidly approaching human spaceflight gap following retirement of the Space Shuttle, the next generation Constellation program and full utilization of the International Space Station." "Griffin, who started as a professor with the University of Alabama in Huntsville this week, said polls show most think NASA receives about 24 percent of the $3 trillion federal budget, but the reality is the space agency gets less than 1 percent out of federal coffers. Its budget is roughly $18 billion a year." "What we do is huge, and we do it for chump change - less than the annual market for pizza," which is $27 billion a year, Griffin said." Editor's note: The speech was really about moving forward with Constellation as is. And while the pizza analogy is funny, the fact is that NASA is trying to do too much with too little. As for Constellation, well that's about to go under review and we'll see how things stand in three months from now. But you can bet there will be non-stop lobbying between now and when the Augustine Human Space Flight Review report is released. By Marc Boucher on May 25, 2009 1:07 AM. "Russia is making plans to detach and fly away its parts of the International Space Station when the time comes to de-orbit the rest of the outpost." "However, the idea of turning the Russian segment of the ISS into an independent space station carries major political, legal and financial pitfalls, Russian officials admitted." "According to Russian sources, they have actively discussed their intentions with American partners, but they have so far failed to come up with a satisfactory solution." Editor's note: If Russia wants to preserve its modules after the partners decide to scrap the space station it is their right to do so. However it does bring up many issues including US - Russia relations which of late have been a little cooler. Russia has started to act like the Soviet bear of the not too distant past and has been flexing its muscles. If the Russians think their modules can survive well beyond 2020 why not persuade their international partners to keep the space station going? Or perhaps Russia wants to go it alone as symbol of wanting to be seen as a superpower again? By Marc Boucher on May 24, 2009 11:55 AM. Editor's: Because of ongoing bad weather in Florida Space shuttle Atlantis landed at Edwards Air Force Base at 11:39 a.m. EDT, completing its 13-day journey. You can watch the post mission news conference live right now on NASA TV. "This mission highlights what the challenges of spaceflight can bring out in human beings," said Bill Gerstenmaier, associate administrator for Space Operations at NASA Headquarters in Washington. "This mission required the absolute best from the shuttle team, the Hubble science and repair teams, and the crew. The results are a tribute to the entire team and the years of preparation." By Frank Sietzen on May 23, 2009 9:43 PM. Frank's note: I remember the sound the wheels made as they clanked on the asphalt pathways of Arlington National Cemetery. In my minds eye I see the sunlights glint on the brass buckles holding saddle to horse, for it was the horses that accompanied the procession that carried his flag-draped coffin that hot summers day. It was July 1999, less than three weeks before the commemoration of the 30th anniversary of Apollo 11. And I, along with many hundreds of others, including the astronaut heroes of my youth, walked that July day in the sun behind the procession that carried Pete Conrad to his resting place high in the hills above Arlington. Earlier, crammed in a small stone chapel on the cemeterys grounds, Willie Nelson played and all of us prayed for Petes soul. He was the second human to have walked the ancient lunar soil to be buried in Arlington. He was only one of many American astronauts who lie there, in that hallowed place reserved for the heroes of our history. This Memorial Day, we remember the many heroes whose sacrifices have kept us free. We will mark the losses of soldiers, sailors, airmen and Marines. But let us not forget those who we have flown beyond the atmosphere and made the ultimate sacrifice. For they, too have made America what it is today-and will someday be for others. For so many of us, space exploration is both a career and a fixation. We eat and sleep it, dream about it, try, usually in vain, to explain our fixation to others. But only a small number of us put our lives on the line to make space flight happen. They-and their families and friends, know the true cost of risking everything to advance human knowledge, explore the unknown, and bring honor and glory and sometimes sadness that punctuates our times. Let us thank all who fly in space, hold dear and close those we have lost, and mark this Memorial Day with both pride and determination that their losses will not be forgotten or diminished by whatever path we take in space. No matter what flavor of space program we favor, we can all agree on that, cant we? Per aspera Ad Astra. God Bless them all, and may God always bless America. Is the International Space Station Truly International? By Frank Sietzen on May 23, 2009 4:28 PM. Frank's note: In a recent op-ed published in the New York Post, Buzz Aldrin called the way the U.S. has managed the International Space Station as a form of Space Age colonialism. Aldrin said the U.S. treated its partners more like participants in the way NASA limited access to the station. He called for the admittance of such new space powers as China, India and Brazil among others, and for the U.S. to loosen its grip on station management. He suggested that the U.S. global reputation would be greatly enhanced in such a move, akin to how the Apollo program burnished Americas image during the 1960s and 1970s when many were opposed to U.S. foreign policy, such as the war in Southeast Asia. My friend Buzz has also made the bold suggestion that the U.S. partly close the spaceflight gap by flying astronauts aboard the Shenzhou as well as the Soyuz. Readers, whats your take on these radical prescriptions by Buzz? Should the U.S. open the ISS to other international partners? Should we make use of the Shenzhou for access to space? Continue reading Is the International Space Station Truly International?. By Marc Boucher on May 23, 2009 8:44 AM. President Barack Obama meets with General Charles Bolden, right, and White House aides earlier this week in the Roosevelt Room of the White House. Editor's note: As expected President Obama has nominated Charles Bolden as NASA's next administrator with Lori Garver to be Deputy Administrator. It seems almost anti-climatic now after we announced on May 14 that Bolden would be the next administrator. President Obama wanted to make the announcement after the shuttle had landed but I suppose with all the "hoopla" surrounding the fact that everyone already unofficially knew, the White House decided to just release the information. Editor's Update: Ok, it's now finally official, but what does this mean? NASA's has some tough budget years ahead of them with Constellation over budget and negative or zero growth budgets coming. President Obama is a science guy and perhaps not so much a human space flight exploration advocate. The reality is that no matter how many speeches he gives where he touts the inspiration of NASA, it takes hard cold cash to make things happen, especially human space flight. NASA's fiscal year 2010 budget request of $18.686 billion includes $456M increase for science and $630M increase for Exploration. Some of that increase is because of the one time Recovery Act stimulus money. If you look at projected budgets for fiscal years 2011, 2012, 2013 you see either negative or zero growth. Already sources say Bolden expressed concern at his meeting with President Obama because he was told that further cuts to human spaceflight in future budgets might be needed. I have no doubt Bolden is a leader, the question is, with the projected budgets he'll have, can he get Constellation back on track and on schedule? And what effect will the Human Space Flight Review Panel have going forward? It's great to see a nominee like Bolden put forward but really how much can he accomplish? Will Bolden be bold in his leadership? "Today, President Barack Obama announced his intent to nominate the following individuals for key administration posts: General Charles Bolden, Administrator of NASA and Lori Garver, Deputy Administrator of NASA. President Obama said, "These talented individuals will help put NASA on course to boldly push the boundaries of science, aeronautics and exploration in the 21st century and ensure the long-term vibrancy of America's space program." Editor's Update: Senator Bill Nelson provides his comments on Bolden's nomination (MP3). As well on the next page is a video response by Nelson. "And he needs to carry out the President's (Bush) mission and that's to have us on the moon by 2020." Continue reading Charles Bolden Nominated for NASA Administrator by President Obama. By Marc Boucher on May 22, 2009 12:48 PM. Editor's note: Unless something dramatically changes Charles Bolden should be the nominee President Obama puts forth very soon. At least one issue came up during his vetting process which was later cleared and that is his lobbying efforts. You can read more about Bolden's lobbying career here. Then there was the meeting with President Obama. By all accounts, the meeting was a pleasant one with Bolden only expressing concern when President Obama discussed the possible need for future cuts to the human spaceflight program. It would seem Bolden is not be in favor of cuts to the spaceflight program. While Senator Nelson has been pushing all along to get Bolden the nomination it appears the only major Senate hurdle at this time is that of Senator Mikulski who appears to have some reservations about Bolden. Editor's Update: The announcement could come as early as tomorrow morning after the shuttle lands. As well Lori Garver, a former Associate Administrator of the Office of Policy and Plans at NASA between 1998 to 2001 and who headed Obama's Presidential Transition Agency Review for NASA, is expected to be named Deputy Administrator. By Marc Boucher on May 22, 2009 12:35 PM. Editor's note: We are heading into a long weekend and I do hope everyone takes the opportunity to enjoy it. NASA Watch on Memorial Day will be publishing on a as needed basis, in other words taking a break ourselves unless something comes up. However should any substantial news happen you can be notified by email - SMS alerts and through any of the following Twitter accounts: NASA Watch, Marc Boucher, SpaceRef, and when he's back online KeithCowing. If you have something newsworthy you can email me, Marc Boucher at marc.boucher@spaceref.com. By Marc Boucher on May 22, 2009 12:29 PM. "Space shuttle Atlantis and its crew will stay in space another day after bad weather prevented them from landing Friday at NASA's Kennedy Space Center in Florida." 11:48 a.m., Orbit 197, landing at Kennedy (deorbit burn at 10:42 a.m.)"
Is the US Global Positioning System at Risk? By Marc Boucher on May 22, 2009 12:51 AM. "Concern over the US Global Positioning System (GPS) stepped up a notch today after a senior official from the US government's congressional watchdog warned that the US Department of Defense faced substantial challenges meeting its space-programme commitments." "Lt. Col. Tim Lewallen, deputy director of GPS at Air Force Space Command at Peterson Air Force Base in Colorado, agreed with the GAO's conclusion that there is a risk that service could degrade. But he said the risk is very small." "US government officials are concerned that the quality of the Global Positioning System (GPS) could begin to deteriorate as early as next year, resulting in regular blackouts and failures or even dishing out inaccurate directions to millions of people worldwide." By Keith Cowing on May 21, 2009 8:33 PM. Scott Parazynski and other IMG climbers reach the summit of Mt. Everest on 20 May 2009 at 3:55 am local time. OnOrbit video by Danuru Sherpa of Phortse, Nepal. By Marc Boucher on May 21, 2009 5:45 PM. NASA's return to the moon will get a boost in June with the launch of two satellites that will return a wealth of data about Earth's nearest neighbor. On Thursday, the agency outlined the upcoming missions of the Lunar Reconnaissance Orbiter, or LRO, and the Lunar Crater Observation and Sensing Satellite, or LCROSS. The spacecraft will launch together June 17 aboard an Atlas V rocket from Cape Canaveral Air Force Station in Florida. Editor's note: Regardless of what architecture we might use to go back to the Moon, the fact remains the launch in June of the Lunar Reconnaissance Orbiter and the Lunar Crater Observation and Sensing Satellite are good science missions. In the press release above I've included four videos which will give you a good overview of the missions. "But LRO will also provide an exciting new window on the past, says Craig Tooley, LRO project manager at the Goddard Space Flight Center which heads the project. The LRO team has been developing a computerized target list "with coordinates on about 50 high priority locations that involve all six Apollo landing sites and dozens of U. S. and Soviet robotic spacecraft touchdown points," says Benjamin J. Neumann director for advanced capabilities at NASA s Exploration Mission Directorate. " By Keith Cowing on May 21, 2009 7:21 AM. By Keith Cowing on May 20, 2009 10:55 PM. Continue reading Video of Scott on the Summit of Everest. By Marc Boucher on May 20, 2009 10:05 PM. "Q Can you read out the meeting with Charles Holden today? MR. GIBBS: I will. I don't know when that is, but we will -- I'll get you something on that. I know with what's going on with NASA and the Hubble, there's obviously great interest in that. MR. GIBBS: I think the President looks forward to meeting with him and hopes that he's the right person to lead NASA in the coming years and through its evolving role." As soon as we know something we'll let you know. Editor's Update: Several sources are reporting the meeting did not go well while another well placed source says we should be patient, it will be any day now. Haven't we heard that before? Further to my note above, today's White House press briefing had no mention of NASA. And it should also be noted that President Obama will deliver a "Major" national security speech tomorrow at the National Archives so I doubt we'll hear anything tomorrow morning. With Atlantis scheduled to land Friday at 9:01 a.m. CDT at Kennedy Space Center, weather permitting, perhaps we might hear something on Friday?? Editor's Update 10:00 p.m. EDT: At least two sources suggest that when Obama suggested to Bolden during their meeting that cuts to the human spaceflight budget might be needed later, Bolden said he would strongly counsel him not to. Otherwise, it was characterized as a pleasant conversation. By Marc Boucher on May 20, 2009 8:58 PM. "And we're soon going to have a new NASA Administrator. I can't disclose it to you, because I've got to have hoopla on the announcement back here on Earth. But I can assure you that it's a high priority of mine to restore that sense of wonder that space can provide and to make sure that we've got a strong sense of mission, not just within NASA but for the country as a whole." Editor's note: Here's the MP3 of the call and transcript of the call. By Marc Boucher on May 20, 2009 7:45 PM. "NASA's Mission Control gave the Expedition 19 astronaut crew aboard the International Space Station a "go" to drink water that the station's new recycling system has purified." "Mission Control radioed the news to the crew Wednesday, following a report from the Water Recovery System team that station program managers approved. The decision is an important milestone in the development of the station's environmental and life support systems, which will begin supporting six-person crews at the end of May." Editor's note: No jokes now, ok? BTW, NASA, if you send me to the space station I'll write a report on the system. By Marc Boucher on May 20, 2009 1:38 PM. "NASA and industry engineers successfully completed the first test of the Ares I rocket's three main parachutes Wednesday. The parachutes -- the largest rocket parachutes ever manufactured -- are designed to slow the rapid descent of the rocket's spent first-stage motor, permitting its recovery for use on future flights." Editor's Update: We've now got the video on the next page of today's test. Continue reading Ares I Parachutes Test Successful. By Marc Boucher on May 19, 2009 10:38 PM. "NASA's PharmaSat nanosatellite successfully launched at 4:55 p.m. PDT from NASA's Wallops Flight Facility and the Mid-Atlantic Regional Spaceport located at Wallops Island, Va. PharmaSat rode to orbit aboard a four-stage Air Force Minotaur 1 rocket. Also aboard were the Air Force Research Laboratory's TacSat-3 satellite and other NASA CubeSat Technology Demonstration experiments, which include three four-inch cubed satellites developed by universities and industry." By Marc Boucher on May 19, 2009 9:39 PM. Editor's note: Today's STS-125 mission briefing included some unusual and candid comments from Dr. David S. Leckrone, Senior Project Scientist for the Hubble Space Telescope. Go to the 21:00 minute mark and start from there. The Constellation program gets an earful. - Video on the next page. Continue reading Candid Comments on the Constellation Program. By Keith Cowing on May 19, 2009 7:15 PM. Scott is now on his way down the mountain to a lower Camp. 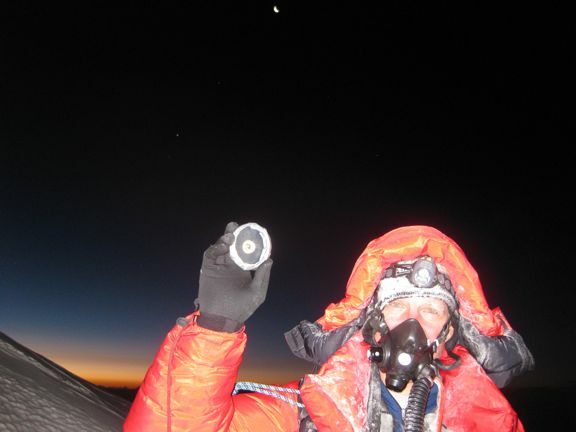 Scott was at the south summit of Mt Everest 8,750 m (28,700 ft) at 2:35 am local time. 8:26 pm Nepal time: Scott has just departed Camp IV and is headed for the summit of Mt. Everest ETA 5 am Nepal time/7 pm EDT - perhaps earlier. Scott is using his SPOT Satellite Personal Tracker to check in. 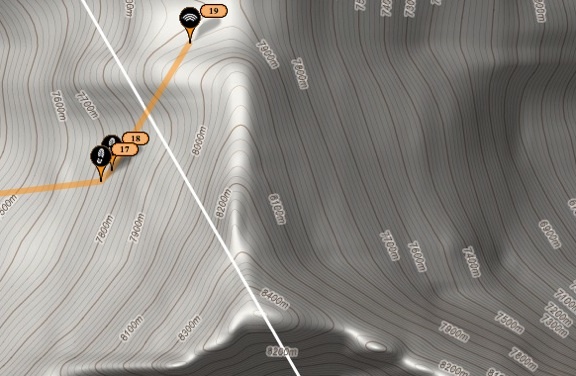 You can follow his progress all the way to the summit by checking his personal tracking page . Select "terrain" to see how close he is getting to the summit of Mt. Everest. By Marc Boucher on May 19, 2009 5:18 PM. "The Presidents FY 2010 budget request for NASA supports the Administrations commitment to deploy a global climate change research and monitoring system, funds a robust program of space exploration involving humans and robots with a goal to return Americans to the Moon by 2020 and explore other destinations, and funds the safe flight of the Shuttle to complete assembly of the ISS through its retirement, planned for the end of 2010. The FY 2010 budget request funds continued use of the ISS to enable the Agency to develop, test, and validate critical exploration technologies and processes and, in coordination with our international partners, to make the ISS available support other government entities, commercial industry and academic institutions to conduct unique research in the microgravity environment of space. It will also stimulate private sector development and demonstration of vehicles that may support NASAs cargo and crew requirements. And it renews NASAs commitment to aeronautics research to address fundamental aeronautics, aviation safety, air traffic management, and mitigating the impact of aviation on the environment. NASAs diverse portfolio of science, technology, engineering and mathematics (STEM) educational activities is also aligned with the Administrations goal of improving American innovation and global competitiveness." Editor's Update: Here is the audio of today's hearing: NASAs Fiscal Year 2010 Budget Request (MP3). By Marc Boucher on May 19, 2009 3:55 PM. "NASA will hold a briefing about two upcoming lunar missions scheduled to launch in June that will begin a journey to better understand the moon. A briefing with members of the mission and science teams will be held Thursday, May 21, at 4 p.m. EDT, in the James E. Webb Memorial Auditorium at NASA Headquarters, 300 E Street, SW, in Washington. The briefing will air live on NASA Television and the agency's Web site. The Lunar Reconnaissance Orbiter, or LRO, focuses on the selection of safe landing sites, identification of lunar resources and the study of how lunar radiation will affect humans. The Lunar Crater Observation and Sensing Satellite, or LCROSS, will impact the moon twice in its search for water ice." By Marc Boucher on May 19, 2009 3:49 PM. Editor's note: Heads up: Because of bad weather at Kennedy the media event tomorrow to view Tranquility Node has been cancelled. By Marc Boucher on May 19, 2009 12:27 PM. Editor's note: Shortly after Charles Bolden meets with President Obama, Acting Administrator Chris Scolese will be headed to today's hearing on NASA's FY 2010 budget request. And not too long after the hearing we will hopefully have astronaut Scott Parazynski summitting Mt. Everest carrying moon rocks from Apollo 11. These events among others makes for a pretty interesting day. 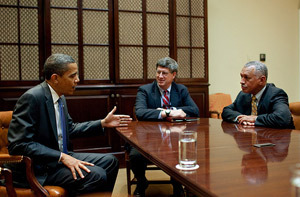 Editor's Update: The meeting between Obama and Bolden is over. We'll keep you posted when an announcement is forthcoming. "President Barack Obama has met with a leading candidate to head NASA. White House spokesman Nick Shapiro said Tuesday that Obama met with Charles Bolden, a former shuttle commander and retired Marine major general. The administration isn't expected to announce a new NASA chief immediately." By Marc Boucher on May 19, 2009 11:42 AM. "The Committee shall conduct an independent review of ongoing U.S. human space flight plans and programs, as well as alternatives, to ensure that the nation is pursuing the best trajectory for the future of human space flightone that is safe, innovative, affordable, and sustainable. The Committee should aim to identify and characterize a range of options that spans the reasonable possibilities for continuation of U.S. human space flight activities beyond retirement of the Space Shuttle. The identification and characterization of these options should address the following objectives: (a) Expediting a new U.S. capability to support utilization of the International Space Station (ISS); (b) supporting missions to the Moon and other destinations beyond low Earth orbit (LEO); (c) stimulating commercial space flight capability; and (d) fitting within the current budget profile for NASA exploration activities. " Editor's note: The above notice appeared in the Federal Register on Friday after being filled on Thursday and was dated May 12 by NASA officials. The committee will exist for six months and can be renewed. Continue reading Human Space Flight Plans Committee Notice Posted. By Marc Boucher on May 19, 2009 1:00 AM. Editor's Update Monday 4:00 p.m. EDT: At the daily White House Briefing, Press Secretary Gibbs said that President Obama will now meet Charles Bolden tomorrow [Tuesday] morning. FYI, our poll "Do you approve of Charles Bolden as NASA's next administrator?" 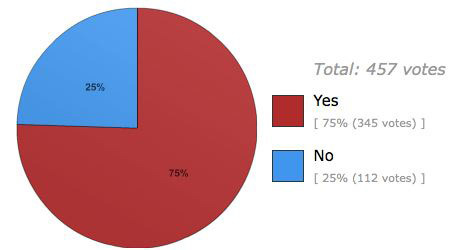 yielded 457 votes of which 75% of the respondents approved of the selection of Bolden as NASA's next administrator. Continue reading Bolden Will Meet Obama Tuesday Morning. By Keith Cowing on May 19, 2009 12:59 AM. Keith's note: Scott's summit window still focuses on a 7-8 pm 19 May / 5-6 am Local time 20 May summit. Scott is walking up to the jetstream. The rest of y'all need airplanes and rockets to do that. Dig it. Continue reading One Of Your Own Will Soon Stand On The Top of Our World. By Marc Boucher on May 18, 2009 6:46 PM. "Over the course of the mission's five spacewalks, the crew added two new science instruments, repaired two others and replaced hardware that will extend the telescope's life at least through 2014. The five spacewalks lasted 36 hours and 56 minutes all together. There have been 23 spacewalks devoted to Hubble, totaling 166 hours and six minutes." "STS-125 mission specialists John Grunsfeld and Drew Feustel completed the fifth and final spacewalk on the Hubble Space Telescope Monday at 3:22 p.m. EDT. Outside the airlock hatch, Grunsfeld said, "This is a really tremendous adventure that weve been on, a very challenging mission. Hubble isnt just a satellite- its about humanitys quest for knowledge." Editor's note: This has been a tremendous mission for NASA and humanity and demonstrates once again the need for astronauts to be an integral part of space exploration. With Charles Bolden surely to be nominated in the coming days, if not tomorrow, and with a review of human space flight plans underway, should he become the next NASA Administrator I hope he demonstrates the leadership every one is looking for and fights for a strong human space flight program that goes beyond LEO. By Marc Boucher on May 18, 2009 4:59 PM. "Lt. Governor Jeff Kottkamp, Chair of the Space Florida Board of Directors, conducted a Special Board of Directors Meeting via teleconference to nominate and vote on an interim president to serve at Space Florida. With a quorum present, the Board unanimously approved Frank DiBello to serve in this capacity while a permanent president is identified." By Marc Boucher on May 18, 2009 2:01 PM. Editor's note: Mark June 17th on you calendar as that's when NASA's Lunar Crater Observation and Sensing Satellite (LCROSS) and Lunar Reconnaissance Orbiter (LRO) will launch on an Atlas V from Cape Canaveral Air Force Station. As part of the lead up and during the mission Paul. D Tompkins, Flight Team Leader of LCROSS has started blogging. Here is a snippet of his latest entry. "This past week, LCROSS and LRO were finally mated together, LCROSS on the bottom, and LRO on top, as I described on my 5/13 post. On Friday, both spacecraft were encapsulated inside the Atlas V payload fairing, the sleek nosecone of the launch vehicle. Now that they are inside, they will remain in this cocoon until they are released into space after launch. Seeing this in photos brought a strange sense of finality to the whole development. Years of effort, and now the team is done designing, done building, and nearly done testing. It really comes down to the launch team and the operations team now. Launch is one month away!" By Marc Boucher on May 18, 2009 12:04 PM. Editor's note: Proponents of the DIRECT Space Transportation System Derivative have released their rebuttal of NASA's October 2007 Direct 2.0 Analysis Findings. Also note that the DIRECT team will offer version 3.0 at the upcoming National Space Society ISDC conference in Orlando later this month. By Keith Cowing on May 18, 2009 9:43 AM. "Please save the date and join Orion Project Manager Mark Geyer and Lockheed Martin Orion Program Manager Cleon Lacefield for an Orion update and All Hands meeting on Thursday, June 4, from 2 to 4 p.m. in the Teague Auditorium. The agenda will be conducted in two parts: Part one - 2 to 2:45 p.m., Orion update and accomplishments; Part two - 3 to 4 p.m., team accomplishments and awards." By Keith Cowing on May 18, 2009 9:33 AM. "Grunsfeld is wearing a spacesuit marked with solid red stripes. Feustel is wearing an all white spacesuit. For this spacewalk, the astronauts will begin with some setup tasks and then move to install the second battery group replacement in an equipment bay above the Wide Field Camera 2 and next to the compartment where the first battery set was installed on the second spacewalk of the flight." By Keith Cowing on May 18, 2009 7:23 AM. "Astronaut Scott Parazynski - in the midst of a historic summit bid at Mount Everest - is carrying some small pieces of moon rock as he climbs to the top of the highest spot on Earth. This sample was loaned to Parazynski's team by NASA which seldom gives out pieces of the lunar regolith gathered by the twelve Apollo astronauts who flew to the moon between 1969 and 1972." By Keith Cowing on May 17, 2009 6:07 AM. "The bio is part of an adventure writing Web site Shipman is running with Oefelein. In their bios, he's known as "Billy O" and Shipman's nickname is "Coll." The two are offering to publications worldwide a list of freelance adventure writing missions. Oefelein claims a long list of writing credits including the New York Times, Washington Post and Newsweek. His bio calls the former shuttle pilot "one of the best aviators of all time." "Nowak was accused of confronting her romantic rival, Colleen Shipman, in the parking lot of the Orlando International Airport in February 2007 after driving from Houston. The initial police report said Nowak wore diapers during her trip but her attorney has disputed that claim. Shipman's boyfriend was former space shuttle pilot Bill Oefelein." Keith's note: From their website: "We're currently working on a couple of books that are sure to raise some eyebrows. Check back for updates." Oh gosh, let me guess: it involves extramarital affairs, throwing away jobs that millions of people would love to have, hiding from the media, and writing tawdry emails on government time. I am certain we'll see your stuff for sale at grocery check out counters really soon. The trailer park crowd will just eat this stuff up. Great role models? NOT. By Keith Cowing on May 16, 2009 11:30 PM. "Moviegoers likely will sit in crowded theaters to watch the new "Star Trek" movie, which premiered on May 8, but not NASA astronaut Michael Barratt. He will have the opportunity to watch the film aboard the International Space Station, while he and two crewmates fly 220 miles above Earth. The only thing missing will be the popcorn. Paramount Pictures transferred "Star Trek" to NASA's Mission Control in Houston, which then uplinked the film to the space station on Thursday, May 14. Barratt plans to watch the film on a laptop computer inside the Unity module". Keith's note: Scott is scheduled to call his friend Mike Barratt from the summit of Mt. Everest sometime around 7-8 pm EDT on 19 May/5-6 am Nepal time on 20 May. Ever wonder what sort of photos Scott will pose for while on the summit? Stay tuned. By Marc Boucher on May 16, 2009 3:23 PM. Keith's note: While everyone waves their arms around and parses short press conference responses in and out of context, senior sources report that this is very, very close to being a done deal. People do not meet with President Obama about a job unless their appointment to the position that they are being considered for is all but certain. All indications point to Charles Bolden as being NASA's next Administrator. Get used to that idea, folks. It is abundantly clear to me based both on sources and logic as I sit here in a cold little tent in Nepal. We'll all know in a very short period of time. Editor's note: As expected Charles Bolden will meet with President Obama on Monday at which time the President will most likely ask Bolden to be the administrations nominee for NASA administrator. He would still need to be confirmed by the Senate and as Frank Sietzen has pointed out in a previous post there is some opposition to Bolden. However Bolden is well liked, has the necessary experience, is a leader and should emerge from Senate hearings relatively unscathed. What is not known is what direction the White House would have him steer NASA towards. And what type of mark he could make himself on the agency. What we do know so far is that the White House has ordered a review of NASA's human space flight plans and is placing a greater emphasis on science programs. Our own reader poll, 404 votes so far, indicates Bolden has a 76% favorable rating as the potential next administrator. Considering the audience that NASA Watch has, the broad support Bolden is getting bodes well for him. "Mr. Gibbs then confirmed that General Bolden was the person Mr. Obama would be interviewing. He will meet with him on Monday, and well see how that goes, Mr. Gibbs said." "Barring some last-minute hitch, these officials said, the nomination could be announced as early as next week. Mr. Obama is scheduled to meet Mr. Bolden on Monday, an Obama administration official said Friday. While the decision is expected, according to this official, it "isn't a done deal yet." A person familiar with the situation said an announcement would follow sometime after the president's meeting." NASA's Next Administrator - Charles F. Bolden? By Marc Boucher on May 15, 2009 10:04 PM. Editor's note: NASA Watch has learned that Major General Charles F. Bolden will most likely be named NASA's next administrator according to our sources. He will still need to be confirmed by the Senate. MSNBC is also reporting this news. Keith's note: As I have said numerous times before, this would a wonderful choice. You don't get face time with Obama unless you are at the absolute top of the list - and no other names are being floated. My guess is that the job is Bolden's if the stars all align properly. So far, align they have. Frank's note: Well, it didn't happen in the first 100 days, but Obama beat both Clinton (who inherited Dan Goldin as administrator but didn't decide to keep him for several months into 1993) and George W. Bush (who kept Goldin on for the better part of a year until drafting Sean O'Keefe- having failed to find a suitable other candidate) in the time it took him to pick a NASA Administrator. Bolden brings both astronaut experience as well as corporate and military management skills to NASA at this critical time, having been sought as Deputy Administrator by O'Keefe, a move blocked (gleefully at the time) by O'Keefe's arch nemesis Donald Rumsfeld. My prediction is a political type for his deputy- maybe Lori Garver gets her long sought patronage appointment? The only question is-what took Obama so long, since Bolden had been talked up for the post for months. Stay tuned! Editor's Update: Poll: Do you approve of Charles Bolden as NASA's next administrator? Frank's update: Sources tell me a powerful member of the Senate Approps Committee has signaled opposition to Bolden, for reasons not yet clear. So the appointment may not yet be a done deal..
Editor's Update - Friday 10:28 p.m. PDT: Someone is going to meet with President Obama on Monday it would seem, and it still appears to be Bolden. "White House press secretary Robert Gibbs confirmed the Monday meeting between Obama and a NASA administrator prospect during today's daily briefing, but wouldn't name Bolden. QUESTION: And on Monday, Robert, will there be a NASA administrator announcement? GIBBS: I think you know that the president will meet with somebody that he hopes will -- wants to meet with somebody about filling the important role of future NASA administrator. GIBBS: He will meet with them on -- on Monday, and we'll have -- we'll see how that goes. " "However, reached by phone May 15, Bolden told Space News he had not been asked to take the job and had no plans to meet with White House officials to discuss it. "I am hearing the rumors, and as far as I know there is no truth in the rumors," Bolden said. "You can't say 'yes' or 'no' when you haven't had a conversation. I haven't had that conversation and I don't have one scheduled." Continue reading NASA's Next Administrator - Charles F. Bolden?. By Marc Boucher on May 15, 2009 3:37 PM. "In this tightly cropped image, the NASA space shuttle Atlantis is seen in silhouette during solar transit, Tuesday, May 12, 2009, from Florida. This image was made before Atlantis and the crew of STS-125 had grappled the Hubble Space Telescope." By Marc Boucher on May 15, 2009 2:01 PM. Editor's note: Since we started running our poll this morning an overwhelming majority of respondents, 82%, view Charles Bolden positively as NASA's next administrator. As well a majority of the comments have been favorable. You can vote in our poll until Sunday and we'll have the final results on Monday. Miles O'Brien has also penned his thoughts on Bolden's potential nomination. He, like others also brings up the point that Bolden has lobbied for ATK who are working on Ares I. It will be interesting to see how the Senate confirmation hearing goes when questions come up about the lobbying when at the same the Augustine panel is reviewing NASA's human space flight plans. With respect to the panel, a week after announcing its formation all seems to be quiet with not a leak of information as to who will be on the panel and when they'll get started. With only 3 months to complete a review, the clock is ticking. "So why did this take so long? Two issues: there is some concern that a former astronaut should not occupy the corner office on the 9th floor at NASA HQ - that they would focus too much on the white scarf squad - and not enough on NASAs chronically needy, yet scientifically significant robotic missions. And there is also the lobbying: Bolden has lobbied for the rocket builder ATK." What Civil Space Agency Would You Create? By Frank Sietzen on May 14, 2009 7:55 PM. Readers, my thanks for some detailed and thoughtful ideas-ytou've obviously been thinking about this for some time. After reading all of your ideas, I'm inclined to support separating out aeronautics from the NASA structure and putting it elsewhere-maybe FAA, maybe a new agency modeled like NACA. NASA's central mission now is exploration-manned and unmanned. That should be the primary focus of what NASA does. Another approach might be to move both Earth science and space science to another agency and have a smaller NASA basically a manned spaceflight operation. But no matter what direction, it seems only a matter of time before some of the agency's field centers are either shuttered or transformed into some form of public-private research partnership outside NASA itself. With the leaner if not drastically smaller budgets likely in the future, it seems that maintaining the status quo agency structure won't be possible. Again, thanks to one and all for a great debate! By Marc Boucher on May 14, 2009 4:00 PM. "The Bay Area Houston Economic Partnership hosted United States Senator John Cornyns Roundtable Discussion on the Status of Human Space Exploration on Saturday at the Silver Moon Caf at Space Center Houston. Listen: RealPlayer MP3"
"Griffin said that NASA does not need the type of review that the Obama administration is proposing, but if it is to occur, he hopes that it convinces the administration to support the manned space program." "A review that once again asks the question, 'Are the goal posts in the right place? Should we go to the Moon? Should we go to Mars? Should we visit the near-Earth asteroids?' - scrambling that mix again, I think, will not be productive," Griffin said. "The goals have to remain in place for longer than a presidential administration or a session of Congress if you are to get anything out of the space program." By Marc Boucher on May 14, 2009 1:46 PM. - Understanding of climate and coupled atmosphere-surface-interior processes." Editor's note: This report was released yesterday. It raises several questions. If humans are to go to Mars, will we do a Mars sample return mission first? NASA and ESA would, but what about China, India or Russia, should they try? And as unlikely as it may seem, what about a potential private venture by a company like SpaceX? It should be noted that there is no funding for a Mars Sample Return mission at this time and that a NASA or ESA or joint Mars Sample Return mission won't happen until sometime after 2020 at the earliest. Is NASA Circling the Wagons Around the Launch Vehicle Elements of ESAS? By Marc Boucher on May 13, 2009 11:14 PM. "The Exploration Systems Mission Directorate has announced the appointment of Dan Dumbacher as acting deputy associate administrator. Dumbacher is director of the Engineering Directorate at NASA's Marshall Space Flight Center in Huntsville, Alabama, where he leads an organization of 1,400 civil servants and 1,200 contractors responsible for the design, test, evaluation and operation of hardware and software associated with space transportation systems and science instruments. He has also served as deputy director for the Ares Projects Office at Marshall and in the Safety and Mission Assurance Office at the center. He has served in numerous other capacities at Marshall in the Engineering Directorate and the Space Shuttle Program." Frank's note: Consider the implications to the culture of MSFC if a decision is made to scrap Ares. How will management retool after basically putting their credibility on the line? Who will have to go-and who will replace them-if either DIRECT or an EELV-variant is chosen to replace Ares? I'm sure, with the Augustine panel now getting underway-the prospect of this result is being discussed-and worried over, too. By Marc Boucher on May 13, 2009 11:13 PM. "Russia will charge U.S. astronauts $51 million per return trip to the International Space Station (ISS) from 2012 and will resume selling seats to space tourists, Russian news agencies reported on Wednesday. NASA needs to use the Russian Soyuz capsule because its own Space Shuttle will be retired next year after nearly 3 decades in service and a replacement is not due until 2014 at the earliest." Editor's note: At first tourists were being charged $20 million and then more recently $35 million. For US astronauts who are trained, well they'll have the privilege of NASA paying $51 million from 2012. That's about a 46% increase from the current tourist cost and in just three years. I wonder what the profit margin is? By Marc Boucher on May 13, 2009 8:46 PM. Editor's note: In this video from the Churchill Club on April 9 on FORA.tv SpaceX CEO Elon Musk talks about his quest for a manned mission to Mars by 2020. Continue reading Today's Video: A Chat with Elon Musk. By Marc Boucher on May 13, 2009 7:10 PM. "The crew was notified of a very small piece of space debris that was identified within a range of interest of the space shuttle. 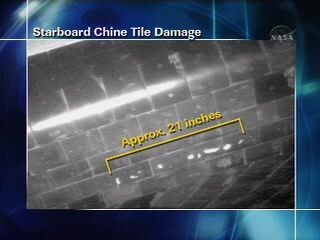 The debris is from the Chinese Fengyun-1C weather satellite, which was destroyed by a Chinese missile test in 2007. The flight dynamics folks stated that the debris is approximately 10 cm in size, 2.8 km in front of Atlantis, .15 km below and 3.9 km out of plane. It is expected to make its closest approach at 7:28 p.m. EDT. It is being tracked, but remains in the yellow category, meaning a maneuver is unlikely. The crew was told that no action was necessary and that a maneuver was not expected." Editor's Update: The Chinese space junk passed by the Shuttle without incident. By Marc Boucher on May 13, 2009 1:33 PM. Editor's note: The Atlantis crew completed the grappling of the Hubble Space Telescope. Mission Specialist Michael Good took over manual control of the approach. Good operated a handheld laser range-finding device, aiming it through the shuttle windows at the telescope to provide Commander Scott Altman with supplementary distance and closing rate information. Continue reading Atlantis Grapples Hubble. By Marc Boucher on May 13, 2009 8:59 AM. "Officials hope the engine eventually will provide a speedier transition between conventional aircraft in the atmosphere and rockets in outer space for deployment of satellites, and reconnaissance or strike missions. The long-range goal of this for the Air Force is access to space, said Charlie Brink, an Air Force Research Laboratory propulsion directorate official who manages the X-51 program from Wright-Patterson Air Force Base." "Partners include NASA, Defense Advanced Research Projects Agency, Boeing Advanced Network and Space Systems, and Pratt & Whitney Rocketdyne." Editor's Update: Another story on the WaveRider by Discovery. "Hoping to bridge the gap between airplanes and rocketships, the U.S. military is preparing to test an experimental aircraft that can fly more than six times faster than the speed of sound on ordinary jet fuel." By Marc Boucher on May 12, 2009 7:18 PM. "Masten Space Systems completed their first vertical take-off, vertical-landing (VTVL) rocket flight demonstration Friday. The demonstration proved out the design and controls of the 730lb rocket-powered vehicle, known as XA-0.1B-750 or "Xombie", its internal nickname." "While the vehicle was attached to a safety tether, it took off, ascended a few meters, descended, and shut down its engine as designed. The instant the engine shut off the entire team yelled, "YES!"" By Marc Boucher on May 12, 2009 6:58 PM. "During that inspection, mission managers noted one area of damage on the forward part of the spacecraft where the wing blends into the fuselage. Initially it appears to be very minor and of no concern for the mission, however the standard expert analysis is underway." "The STS-125 crew will begin its sleep period at 8:01 p.m. and awaken at 4:01 a.m. Wednesday. The next shuttle status report will be issued after that wake up call or earlier if events warrant." Editor's Update: Mission control has informed the crew that there will be no need for a focused inspection of the affected small damaged area. The crew was happy to hear the news. This is like dodging bullets! Retirement of this aging system is clearly in the national interest-before another accident calls into question the entire viability of NASA's human spaceflight program. If there was another Shuttle disaster in these handful of remaining flights, how would America react? How would Obama react? Let's hope we never have to find out. Frank's add: Sorry readers but I stand behind my comment. While it is true the foam problem has been significantly reduced, it hasn't been eliminated-and with the Shuttle you are always one serious debris strike from a serious if not fatal turn of events. It was the CAIB that suggested that flying the Shuttle poses risks that cannot be quantified-there are increasing problems that make themselves know only during flight, problems not previously anticipated. There will NEVER be enough funding to fly the Shuttle through the gap until Orion is ready-that's a political fact of life, no matter the huffing and puffing of politicians, who are unable to add more funds to the NASA top line for anything more than one more Shuttle flight. it is a system that has served the nation well-and time for it to be retired with grace and honor. By Marc Boucher on May 12, 2009 1:20 PM. Editor's note: If you have not seen NASA's HD video of the STS- 125 external tank as it falls to earth after yesterday's Shuttle launch I urge you to watch it. It's spectacular. Make sure to select the HQ option. Continue reading Today's Video - External Tank Falling to Earth in HD. By Marc Boucher on May 12, 2009 1:00 PM. "During preliminary inspections of launch pad 39A following yesterday's Atlantis launch, 25 square feet of Fondue Fyre from the North side of the solid rocket booster flame deflector was found to be liberated. The liberated Fondue Fyre appears to be next to a section of the of the solid rocket booster flame deflector that was repaired after STS-120. Some pneumatic lines (gaseous nitrogen, pressurized air) in the area were damaged and will need to be repaired. Preliminary indications are that there will not be an impact to Endeavour's June launch from pad 39A and this does not impact in any way our ability to launch Endeavour from Pad B should the need arise." "Just as a swimming pool is coated with a protective layer before it is soaked, the flame trench will be sprayed with Fondue Fyre, a fire-resistant concrete, to shield it from fire and smoke." "Fondu Fyre is a heat resistant concrete developed during the Apollo space program." By Marc Boucher on May 12, 2009 2:36 AM. Spirit is in a very difficult situation, JPLs John Callas, project manager for Spirit and its twin rover, Opportunity, said Monday. We are proceeding methodically and cautiously. It may be weeks before we try moving Spirit again. Meanwhile, we are using Spirits scientific instruments to learn more about the physical properties of the soil that is giving us trouble. Editor's note: Looks like Spirit is in a really tough position. The improved power situation could help. The little rover that could will surely survive this problem, right? If not, what a mission it's been. By Frank Sietzen on May 11, 2009 7:32 PM. Heres my input: Elon is a great rocket scientist, but with a vested interest in COTS D, his appointment is unlikely. While some readers mentioned academics and politicians, keep in mind Mr. Augustines statement that the panel would seek out astronauts, engineers, and others capable of evaluating the technical merits of human space flight. I dont profess to have the technical smarts to know whether or not Ares or EELV should lift Orion, but having written a book on the birth of the VSE (along with Keith) I still think it makes sense as the next step in human spaceflight-perhaps with a bit more emphasis on Mars over lunar outposts. The original VSE called for use of the moon only as a technology test bed to develop the systems that can take us further into the solar system. Since the departure of Admiral Steidle, that seems to have been deemphasized-a big mistake, in my view. I think my friend Buzz Aldrin is spot on in his missive to keep our eyes on the prize and not get locked into another moon race with the moon as the primary destination. Many readers called for extending the life of the Shuttle and ISS as well. But in todays constrained environment, many more Shuttle flights much beyond 2011 and theyll be little left to pay for any new launch vehicle. Readers, thanks for your comments. Lets see what happens next! BTW, now that you've had a say-anybody change their minds? By Marc Boucher on May 11, 2009 4:56 PM. Editor's note: Here's a heads up, the House Committee on Science and Technology will conduct a full committee hearing on May 19 between 2-4 p.m. EDT. Mr. Christopher Scolese, Acting Administrator, NASA will be the only witness. The hearing will be webcast. By Marc Boucher on May 11, 2009 11:59 AM. Editor's Update: Four member of the final inspection team are back at Launch Pad 39A to take a second look at some ice that is located on an umbilical on the left side. They are doing their inspection from the zero level of the pad. Editor's Update: The issue ice is resolved and everything is a go. They are just looking at some cloud buildup to the north. Editor's Update: Liftoff, everything looks great so far. Continue reading Liftoff of Atlantis. Dennis Wingo - Why Space? Why Now? By Marc Boucher on May 11, 2009 1:20 AM. "With the advent of the Augustine Commission II an opportunity has arisen for a discussion on the philosophy of space. Therefore the purpose of this missive is to look at where many in society see our future going, and to show where space either supports the positive aspects or negates the negative ones. Without this connection, we have no future in space for human spaceflight and the drums of doom will continue to sound over our world." By Frank Sietzen on May 9, 2009 10:52 AM. Frank's note: OK, NASAWATCH readers, let's hear your ideas on the future of NASA's human spaceflight program, as if you had the chance to testify before the newly created Augustine Commission. Please be direct (no pun intended) and brief and to the point. Get specific. Secondly, who would readers like to see joining Norm Augustine as one of the other 10 appointees? Please explain your choice(s). By Keith Cowing on May 9, 2009 1:00 AM. Update 10:00 am Nepal time 9 May: Scott is back at Everest Base Camp - disappointed - but otherwise doing fine. Update 9:11 am Nepal time 9 May: Weather conditions atop Mt. Everest have become unacceptable for further ascent at this time. Scott and other climbers have begun to descend from Camp II and should be back here at Everest Base Camp any moment now. "Keith Cowing: I just spoke with Scott at Camp II by radio . He sounds cheerful, rested -- and excited. Scott is currently on a rest day before tomorrow's push to Camp III - but he is not just "resting". "Keith Cowing: There was a massive avalanche off of the west shoulder of Mt. Everest this morning. Within a very short period of time the entire lower Khumbu Icefall was enveloped in pulverized ice and snow." Track Scott's progress via SPOT here. By Marc Boucher on May 8, 2009 4:50 PM. "NASA astronaut Mark Polansky, commander of the next space shuttle mission to the International Space Station in June, is sharing updates about his training and flight on Twitter." Editor's note: Lately I've been getting a lot of press releases from NASA related to social media services they are now using or news stories with links to their social media sites. I applaud NASA for using many of these popular social media services for their education and public outreach efforts (E/PO). For STS-127 commander Mark Polansky will be using the Twitter account http://www.twitter.com/Astro_127 and the YouTube channel http://www.youtube.com/reelnasa. By Marc Boucher on May 8, 2009 11:59 AM. Editor's note: NASA held the first briefing with Norman Augustine, Chairman of the Human Space Flight Review. Below is the audio teleconference MP3 for you to download. The independent committee will be 10 members from astronauts, engineers who have operational experience, industry, and academic backgrounds etc. From NASA, Mike Hawes will be the technical director and Philip McAlister will be the executive director. "We are where we are we, we have programs underway, there are systems of existing and being built, and so that's sort of the starting condition, which doesn't mean you have to abide by them in the future, but you can't ignore as starting position obviously." The review will be public except when dealing with certain issues as classified matters, personnel issues and competitive sensitive matters. The public will be allowed to comment at some meetings and through a variety of others ways including a web site. This would include anonymous feedback so that people could talk without worries of reprisals. By Marc Boucher on May 8, 2009 2:07 AM. "NASA is running out of nuclear fuel needed for its deep space exploration. The end of the Cold War's nuclear weapons buildup means that the U.S. space agency does not have enough plutonium for future faraway space probes except for a few missions already scheduled according to a new study released Thursday by the National Academy of Sciences." By Marc Boucher on May 8, 2009 2:06 AM. "Long-haul trips could be made in spaceships instead of planes in 20 years' time if Virgin's efforts to commercialize space travel succeed, the president of Virgin Galactic told Reuters in an interview. Will Whitehorn said Virgin's plans to take tourists into space were just a first stage that could open up a range of possibilities for the company including space science, computer server farms in space and replacing long-haul flights." Editor's note: It's deja vu again. Here's one oldie but goodie from 1990. By Marc Boucher on May 7, 2009 4:01 PM. "The Obama Administration today announced the launch of an independent review of planned U.S. human space flight activities with the goal of ensuring that the nation is on a vigorous and sustainable path to achieving its boldest aspirations in space. The review will be conducted by a blue-ribbon panel of experts led by Norman Augustine, the former CEO of Lockheed Martin, who served on the Presidents Council of Advisors on Science and Technology under Democratic and Republican presidents and led the 1990 Advisory Committee on the Future of the U.S. Space Program and the 2007 National Academies commission that produced the landmark report, Rising Above the Gathering Storm: Energizing and Employing America for a Brighter Economic Future, as well as a number of other high-profile national commissions." Frank's note: A better choice to lead this review could not have been made. It is clear that Ares and its challengers will get a fair hearing-and once and for all clear the air on whether ESAS made the right choices as per ballistic capsules and solid-rocket booster launchers. But still no NASA leader emerges? What does that say about Obama's commitment to civil space? Keith's note: I agree with Frank. NASA has picked one of its most well-rounded and experienced managers to run this review activity. Mike "gets" the big picture and I am certain that this panel will be encouraged to think that way as well. Editor's note: Mike Hawes, Associate Administrator of Program Analysis & Evaluation to be NASA interface to Human Space Flight Blue Ribbon Panel. Mike is well respected and should be an asset. Editor's update: There will be teleconference tomorrow morning Norman Augustine, chairman, Review of United States Human Space Flight Plans Committee. "NASA will hold a media teleconference on Friday, May 8, at 11:30 a.m. EDT, to discuss the launch of an independent review of NASA's human space flight plans." Editor's update: Although Acting Administrator Scolese said Constellation would continue to move ahead, the Altair Lunar Lander and Ares V design support contracts are being put on hold until after the review. Editor's update: The Ares 1-X test flight won't happen until after the review is complete. By Marc Boucher on May 7, 2009 4:00 PM. Editor's note: We will have ongoing budget news throughout the day including the actual budget documents when they are released shortly. "According to administration officials, NASA will announce tomorrow that it will convene a blue ribbon panel to examine, among other issues, whether the Ares I rocket and Orion capsule are the best option to send astronauts into orbit by 2015 after the shuttle retires next year. The panel will start as soon as this month and be finished by September." "The Planetary Society gives the Administration's proposed NASA budget a thumbs up for its increased funding for space and Earth science, more Earth observation satellites, firm support for robotic exploration of the solar system and the development of the new Ares/Orion launch vehicles to replace the space shuttle." Editor's note: I'm a little surprised at the "thumbs up" support and positive spin the Planetary Society is putting on this budget. Without a new administrator in place and a review of the Constellation program set to start shortly, along with the potential consequences of that review, I would not categorize the state of affairs at NASA in such a positive light. Frank's note: The handwriting is on the wall. While NASA dodged a bullet in FY2010, the agency's future is really at stake. While it could have been worse, there is nothing in here to suggest a long term commitment to either the moon or Mars. Ares? only in our dreams. Editor's Update: It should be noted that after the Blue Panel completes it human spaceflight review, NASA will provide an updated request for the Exploration activities portion of the budget reflecting the review's results. Editor's Update: NASA's budget request combined with FY 2009 appropriations provides a $1.8 increase to NASA's programs in FY 2009 and FY 2010. This includes a $630M increase for Exploration, $456M increase for Science and $263M increase for Areronautics. It should be noted this is increase is in part because of the $1 billion provided to NASA as part of the American Recovery and Reinvestment Act. Looking forward things don't look so rosy. FY2011 & FY2012 see a small decline in projected budgets while FY2013 sees no growth. Scolese said in reference to future budgets "then recognizing fiscal realities in developing a fiscally responsible budget, it doesn't grow, it doesn't grow as fast as any us would like, but those are the realities that we live with". Scolese was trying to make the case that the Obama administration is very supportive of NASA and that in fact he had seen the President no less than three times in the last month. However if the Obama administration was so supportive, why not name a new administrator? And if Scolese is doing a good job, why not remove the acting from his title and make it official. 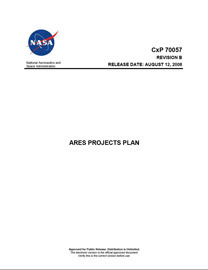 Video of NASA FY 2010 Budget Press Briefing on next page. Continue reading NASA FY2010 Budget Day. By Marc Boucher on May 7, 2009 3:49 PM. "Space Florida's president Steve Kohler has resigned his $175,000-a-year post and is walking the halls of NASA headquarters at Kennedy Space Center saying goodbye." By Keith Cowing on May 7, 2009 3:44 AM. Editor's update: At 12:14 Nepal time Scott radioed in to Base Camp that he had arrived at Camp II. Editor's note: Scott is on his way to the summit of Mt Everest. He departed IMG Base Camp just after 4 am local time this morning (7 May) with his Sherpa guide Danuru. The moon was out and the sky was crystal clear. ETA at the summit is 7-8 pm EDT 10 May (5-6 am 11 May Nepal time). By Marc Boucher on May 6, 2009 11:30 PM. "The original study was produced and made available to the public but not the set of 12 appendices that had the background technical trades and justifications related to the launch vehicle choices. Apparently this past weekend, a pay for view space interest website is providing these documents (reportedly 11 out of 12 of the appendices) to people that have paid for access to this website." Editor's note: The ESAS study is in the public domain except for the appendices and now they're on a pay-per use site! Isn't time NASA released the appendices? Editor's Update: From Keith Cowing: "I find it shameful that a foreign-owned website should be charging American taxpayers for the right to view documents produced by their own government - documents they have already paid for." Editor's Update: It has come to our attention that the ESAS Study Appendices are now on WikiLeaks courtesy of NASA Space Flight. It should be noted that NASA Watch does not always release documents that come into our possession because of security, sensitivity or legal issues. However when we feel a document should be released to the public, as this one should, we file a Freedom of Information Act (FOIA) request and await the outcome. By Marc Boucher on May 6, 2009 6:08 PM. Editor's note: It seems Senator Bill Nelson tweeted some relevant news a few hours ago: "White House tells me the president will fly all nine remaining shuttle missions - even if it means flying the shuttle an extra year." Which makes me wonder, will we find about the next NASA Administrator through Twitter first. Editor's Update: I should also point out that aside from receiving the news from Twitter, the important thing here is that the door is open for the Shuttle to potentially fly another year. This means money has to be provided to support an extension. Tomorrow's budget and other potential announcements might provide some clues. By Marc Boucher on May 6, 2009 12:37 PM. "The Ares I is a two-stage series-burn launch vehicle with interfaces for the Orion payload and the ground systems at the launch site (see Figure 1-7). The first stage has a RSRMV with thrust vector control (TVC) and a separation system. The motor utilizes polybutadiene acrylonitrile (PBAN) propellant. The upper (second) stage is a self-supporting cylindrical system that houses the LOX and LH2 tanks that feed propellant to the J-2X engine, along with the vehicles avionics, roll control, and the upper stage thrust vector system. Organizationally, the Ares I hardware elements consist of the First Stage (FS) Element, Upper Stage (US) Element, and Upper Stage Engine (USE) Element. These elements are further discussed in Section 1.6, Technical Summary. The Ares I can lift an estimated 25.5 metric tons (mT) (56,200 pounds (lb)) to LEO at a 30100 nautical mile (nmi) 28.5-degree orbit and 23.7 mT (51,500 lb) at a 51.6-degree orbit (see Figure 1-8). The Ares I is estimated to be as much as 10 times safer than the Space Shuttle, primarily due to its in-line design and launch abort system (LAS) for crew escape. The Ares I system is further described in CxP 72070, Ares I Integrated Vehicle Design Definition Document (IVDDD)." By Marc Boucher on May 6, 2009 12:49 AM. "NASA Acting Administrator Chris Scolese will brief the news media about the agency's fiscal year 2010 budget at 2:30 p.m. EDT, Thursday, May 7. The news conference will take place in NASA Headquarters' James E. Webb Memorial Auditorium, located at 300 E St. S.W., in Washington. Scolese will be joined by NASA Comptroller David Schurr. The news conference will be broadcast live on NASA Television and the agency's Internet homepage. Reporters at NASA Headquarters will be able to ask questions." Editor's note: We will have updates throughout the day. By Marc Boucher on May 5, 2009 2:22 PM. "Apparently, the view of NASAs acting Administrator is that the Moon is a box to be checked-off on the way to Mars. Hence, we dont really need to establish an outpost because were just satisfying a political requirement in implementing policy, not conducting a technical experiment to use the Moon to prepare for journeys beyond." Editor's note: Dr. Paul Spudis makes the argument that a Moon Outpost makes more sense than sorties and that NASA really wants to bypass the Moon for Mars. At current and foreseeable budget levels the cost of a Moon Outpost would be substantial and have significant detrimental effect on NASA's other programs. Recognizing that fact and wanting to go instead perhaps to near Earth asteroids and Mars, does last weeks testimony of NASA Acting Administrator Chris Scolese really in fact signal a change in direction? A direction that might exclude building a Moon Outpost? Should NASA focus on exploration beyond the Moon and perhaps instead enter a public-private partnership for a Moon Outpost? Or perhaps NASA should enter into a partnership with other countries such as Japan, India, Russia and the EU? What do you think? Editor's Update: Let's add this to the equation. The direct folks might be happy. "In a major turnaround, the White House is expected this week to order a review of the fledgling spacecraft program that NASA had hoped would one day replace the space shuttle, the Orlando Sentinel has learned." "Now Direct proponents are hopeful that their rocket design will get a second look by the new panel created to examine Ares and all viable alternatives." By Marc Boucher on May 5, 2009 12:40 PM. "For the first time in recent memory, backers of Florida's space industry walked away from the two-month legislative session utterly empty-handed. With NASA already making the first of at least 3,500 layoffs and as many as 10,000 at Kennedy Space Center, the Legislature failed to pass a single space-related bill by the end of regular business last week. And lawmakers devoted no new money to averting the economic calamity that will strike when the space shuttle is mothballed." Editor's note: Ok, the economy is bad and unemployment in Florida has reached 9.5%, but one wonders why Space Florida couldn't achieve much of anything other than being mired in controversy. By Marc Boucher on May 4, 2009 8:50 PM. Editor's note: Ok, I'm curious to know from you the readers how you would vote on the following question. Should NASA Watch enable discussion forums? Note: This question does not mean forums are coming to NASA Watch any time soon. By Marc Boucher on May 4, 2009 8:10 PM. "Eilene Marie Galloway, one of the worlds leading experts in space law and policy, died at her home in Washington, D.C. She was 102. Dr. Galloway resided in the District of Columbia for 78 years." "October 4, 1957, when the first artificial satellite began orbiting the Earth, nations reacted with fear of atomic bombs launched by rockets. Sen. Lyndon B. Johnson, Chairman of the Preparedness Subcommittee of the Senate Armed Services Committee, asked Eilene Galloway, National Defense Analyst of the Library of Congress, to serve as Staff Consultant for hearings on U.S. preparedness in space. When it became clear that the problem involved scientists and engineers in more than military aspects, the Senate organized the Special Committee on Space and Astronautics, which Eilene served by formulating questions for witnesses and analyzing testimony." By Marc Boucher on May 4, 2009 12:52 AM. "First, a skilled work force is displaced. Money is wasted. Overall program success decreases. Furthermore, starts and stops harm the NASA-industry partnerships necessary to assure America's leadership not only in exploring space, but also keeping a close eye on our home planet - Earth." "Since Michael D. Griffin stepped down as NASA administrator in January, Christopher Scolese, a longtime NASA official, has served in the role on an interim basis. A new NASA boss, however, will arrive at the agency too late to take part in several important decisions. Mr. Scolese and other NASA officials are in the middle of putting together the agencys 2010 budget, which may be unveiled as soon as this week." By Marc Boucher on May 3, 2009 11:21 PM. "It is with the deepest sense of sadness that I inform the NASA community of the passing of Joseph S. Algranti. As the Chief of Aircraft Operations at the Johnson Space Center during the Apollo Program, "Mr A" as we all called him directed the Lunar Lander Training Vehicle (LLTV) program to successfully train the Apollo Lunar Crews to land on the Lunar surface. During its development stages, Joe had to eject from an LLTV only seconds before it crashed. He was an undaunted pilot, leader, and friend. The list of aircraft that he was qualified to command was impressive. I count it an honor to have worked for this man who dedicated his career to the success of NASA. He will be missed by all of us." "Joseph Samuel Algranti, 84, of LaGrange, died Wednesday, April 29, 2009 at Hospice LaGrange. Mr. Algranti was born February 8, 1925 in New York , son of the late Samuel Joseph Algranti and Beatrice Carol Algranti. He graduated from the University of North Carolina at Chapel Hill with a BS in Physics. He was a pilot in the U.S. Navy and retired as a Commander in the Naval Reserves. He began his career as a research test pilot in Cleveland , OH at NACA. Next he moved to NASA at Langley , VA. From 1962, he assumed the role of Chief of Aircraft Operations and Chief Test Pilot at NASA in Houston, TX , where he was instrumental in the training of all aspects of the space program. He retired from NASA in 1992, and after retirement, he moved to Chapel Hill and then to LaGrange. In lieu of flowers contributions may be made to Hospice LaGrange in memory of Mr. Joseph Samuel Algranti. Arrangements are by Striffler-Hamby Mortuary, 1010 Mooty Bridge Road. (706) 884-8636. www.striffler-hamby.com"
By Keith Cowing on May 3, 2009 12:07 AM. 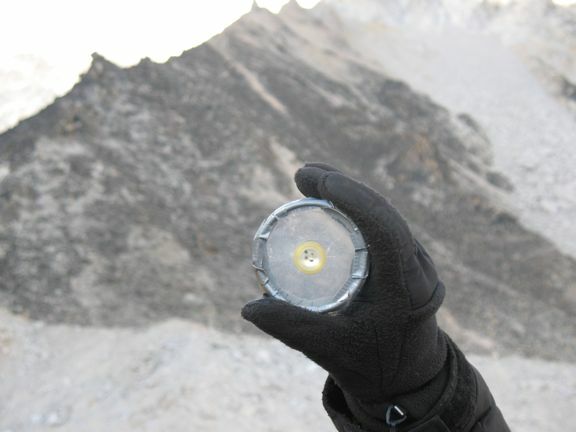 This video was taken on 17 April 2009 at Camp 2 on Mount Everest at 21,500 feet. In it, IMG climber Scott Parazynski talks live via satellite phone Michael Barratt aboard the International Space Station on the occasion of his 50th birthday. In the background are three sherpas - the middle one, Danuru, will accompany Scott to the summit. Together they are known as the "Singing Sherpas". Video courtesy of Ed Wardel. By Keith Cowing on May 2, 2009 12:21 AM. Editor's note: News reports that Lori Garver is in charge of a re-look at Project Constellation and that Pete Worden is in charge of an ESAS re-look are not true according to utterly reliable sources within NASA who are most certainly in a position to know. By Marc Boucher on May 1, 2009 11:34 AM. "I thought it would be particularly timely, considering Nick Skytlands recent posting of an internal NASA email about recent NASA Strategic Management Council decision to target-hire younger workers, and, the recent posts on NASAWatch about the state of the Federal workforce. Many of the comments that followed on that website requested some data data about NASA and the contractor workforce. To that end there are two attachments to read in support of this posting. " Editor's note: Richard Leshner at NASA headquarters is continuing the discussion about NASA workforce issues with a new post at Open NASA where he answers some basic questions. Below is some useful reference material for you including the PDF files Richard references.